Melt the butter. Layer 3 sheets of phyllo dough one on top of the other brushing each with a small amount of melted butter. Cut out 12 circles (7,5 cm--3" diameter) with a pastry cutter. Place on a baking plate and bake in the oven at 350oF (180oC) for 4 to 5 minutes. Watch closely as this dough bakes very quickly. Mix the sour cream, flaked crabmeat, lemon juice, chopped dill, salt and pepper in a bowl. 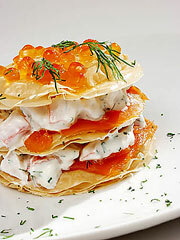 Prepare the crisps on each of the plates by placing the smoked salmon and the crab cream on one of the phyllo crust circles. Repeat the operation ending with a layer of phyllo crust. Decorate using the dill strands and salmon roe. J.Soulard: As soon as you take the phyllo dough out of its wrapping, quickly brush with melted butter because phyllo dough dries very quickly. If the operation takes time, protect the roll of phyllo dough with a humid cloth once it has been taken out of the wrapper. Suggested wine: Graves (on lees), at least 3 years of age. Jean Soulard, executive chef at the Château Frontenac, is well-known by the gourmets who relish both his writings (two years ago, he published a lavishly illustrated and tastefully accessible recipe book called Naturellement where this recipe can be found) and television appearances (the program "Cuisinez avec Jean Soulard" broadcast on Canal Vie). His dishes are as delicious as they are relatively easy to make, as the preceding recipe illustrates. Mister Soulard admits that the inspiration for his recipes sometimes comes to him very naturally in the most unlikely places, frequently during his daily jogging. In this case, he decided to call one of his preparations "Abduction of Smoked Salmon Crisps in a Crab Seraglio" after listening to Mozart's "Abduction from the Seraglio". He admits to having eclectic musical tastes ranging from classical music (including the more contemporary repertoire) to the rave music his daughter has him listen to sometimes. His long car trips put him in touch with music since it is naturally out of the question to play music in the kitchen in the full effervescence of hotel life. It is quite possible that the subject of the opera was suggested by Emperor Joseph II himself, since the work was due to be created during a state visit by Russian Grand Duke Paul Petrovitch to Vienna to negotiate a secret alliance allowing Austria and Russia to take over a substantial part of the Ottoman Empire. After numerous rewriting sessions, the première finally took place to loud applause and whistling on July 16th, 1782 at Vienna's Burgtheater. A number of critics complained about the scantiness of the libretto and the poor level of the poetry but Die Entfürung aus dem Serail was to remain the best appreciated opera during Mozart's lifetime. No doubt this was due to the images of exotic adventures conjured up by the subject matter as well as the fascination of his contemporaries for Turkish harems. The opera will be performed by l'Opéra de Québec. March 8, 11, 13 and 15, 2003.